Though I have written nearly 80k words worth of WIP6 rough draft and research to date, the plot and story presently feel more disjointed and awkward than I imagine a rough draft should. I have therefore called a halt to any further composition until I have put my story through some sort of structured filter (read outline) by which it can be examined for missing and/or misshapen features. What follows is my plan. The major move continues. Yesterday, we loaded up my brother-in-law’s truck with storage items and filled a rented 10′ x 15′ space with a lot of things I identify with and that defined who I’ve been. I have placed more precious things—swords, bagpipes, special collections—in storage with kind friends and relatives. I am going to go “live” in an 11′ x 11′ bedroom with about a third of my library crammed into seven bookcases lining the walls. I jokingly refer to it as “The Monk’s Cell” but think of it more as a “Hospital” or “Chrysalis” where I will convalesce and treat my divorce wounds. 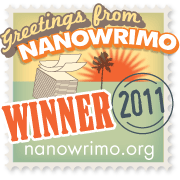 As mentioned in the post before this one, I plan to participate in this year’s NaNo as both emotional comfort food and as a break-from-the-sadness activity. Directing my focus on such an engrossing mental exercise and meeting interesting people with a common passion will be both positive and healing. I look forward to finally drafting this particular manuscript, testing its “seaworthiness” and trim, deciding if it is the vessel with which to attempt circumnavigating the publication globe. I am a bit nervous too. 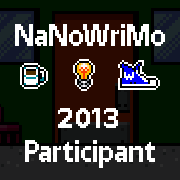 To put it bluntly, the NaNoWriMo is a young person’s game. Though older writers participate, and are encouraged to do so, it cannot be denied that the overwhelming demographic is between the ages of 13 and 30. As a high school teacher, I’m comfortable with that crowd; they are as familiar to me as 27 years of classes and parent-teacher conferences can make them, but I’m not here as a teacher. I’m a writer, and in particular, a writer seeking social contact with other writers, otherwise I would simply write my manuscript in private. Rejection warps the perspective and patinas the world in wary, almost paranoid, colors. If I’m not careful, that warped perspective can paint the NaNo landscape as hostile, catering only to the future wherein the young majority, creeped out on stranger-danger, keep the old at a distance…particularly old men like me. I know this is spurious, nonetheless, I’ll need to keep a tight rein on my heart, constantly questioning the validity of my feelings, and reminding myself that I perceive the world though the lens of recent experience. This is also true concerning my perception of time. It is very hard not to be resentful at how much of this commodity the younger set has. It truly is a resource more precious than diamonds. I am envious that they have the luxury to explore and develop their writing, growing in both confidence and skill with each experience. Had I gone beyond my adolescent and clumsy Conan pastiches, who knows where I might be today? True, there was no NaNo then, but there certainly wasn’t anyone telling me “No” either. Still, under rejection’s influence, I acutely feel those lost hours as I scan the NaNo forums for sincere people with whom I might exchange writerly cheer and encouragement. I’m presently writing prelim notes for my WIP. The working title is Arenn’s Sorrows. I’ve followed Holly’s curriculum to about halfway through Lesson 9: “How To Plan Your Project Without Killing Your Story.” If I’m lucky, I’ll get the rest of it done by October’s end. 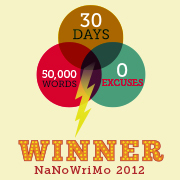 Regardless, I plan to start the rough draft on November 1st using NaNoWriMo as my gate. I’m still struck by the timing of it all: that by the evening of the 29th the move will be done, that the lease is up at midnight on the 30th, and that I’ll say “goodbye” to Bridgewood and the Last Library forever. A day later we’ll celebrate Samhainn with a fire in the pit and on that night, as the cinders whirl upwards like fiery prayers, the world will change. While my grieving will not nearly be finished, and I’ll forever wish with all my heart that circumstances were different, nonetheless, on November 1st, I will begin again and plan to celebrate with a 1,667+ word day! After being asleep for over a decade, I unexpectedly woke up in the mountains yesterday. It was like a sudden and unlooked for encounter with an estranged friend or like going for a familiar walk only to have the ground give way. Standing at the stone railing of Yosemite Valley’s photogenic vista-point, memories and emotions spooled as I my eyes reacquainted themselves with a place I had not seen in years but which I had once known and hiked often. I slowly become aware of myself, the dull throbbing in my knee, the effort to draw a satisfying breath, the leaden heaviness of my limbs, the telling gray of my beard, and the wide yawning void between then and now. Surrounded by youthful energy and exuberance, I was brought up short by just how far this [old] “…hawk…” was “…from the moon.” And I realized, I wasn’t simply looking at the Valley. I was gazing into a mirror and the estranged friend I found there was not someone else; it was me. 20 years ago, I fell in love with a remarkable woman. Up to that point in my life, I had never felt so deeply. I did everything I then could to insure that the relationship might last. Alas, despite mutual best efforts, the romance ended after nearly three years. Two decades later, I understand it was necessary, but at the time, it was very hard and I foolishly wanted to know why the relationship had ended. I was too naive to understand that asking such questions—questions which have no answers or wherein even the truth is unsatisfactory—is narcissistic, indulgent, and ultimately self-destructive. Such quests are not really about looking for truth so much as they are about looking for an answer that will satisfy an unreasonable belief that it exists, a belief that could that answer be found everything would somehow make sense and the unlivable made livable. Of course I found nothing. The human creature, however, is amazing particularly in its ability to adapt and, if unable to adapt, to create unique coping mechanisms. Unable to find satisfactory answers, I went about subconsciously creating a self whom I could understand someone wanting to leave. Unaware I gradually ceased to pursue many mutually beloved interests because associated memories were too painful. Subsequent relationships suffered and failed unknowingly haunted by those memories. Many longterm projects and cherished ambitions were unconsciously abandoned. I’m happy to say that over time I healed, became aware of and recovered from my coma-like foolishness, and while I still remember that long ago relationship and the woman I loved, I do so now with mature fondness. It’s no longer the unseen and internal ulcer I aggravated into being. This does not mean there aren’t scars or that all the damage I did to myself simply vanished. On the contrary, consequence-driven conditions still exist and here at the vista-point over looking Yosemite Valley, I was suddenly face-to-face with one. “We” had been avid backpackers and hikers. Sometimes by ourselves. Sometimes with a group of likeminded people or my brothers and daughters. We’d been to locations in the Carson Iceberg and Immigrant Wildernesses, Big Sur, and areas in Arizona. It was, in her words, “…our thing…”. Between our adventures, I went out alone or with my brother braving longer treks. I counted a summer as good if I spent more time in a sleeping bag that in a bed. Each summer I went for one or two weeklong solo trips leaving a brother or my mother an envelope addressed with a date and a stern admonition not to open it unless I’d not returned by the date and time indicated. “Shining times” my brothers and I called them imagining ourselves spiritual successors to Fredrick Manfred’s Hugh Glass of Lord Grizzly or Vardis Fisher’s Jeremiah Johnson of Mountain Man or any other dozen over used and romanticized wilderness icons from Daniel Boone to Grizzly Adams. After the breakup, however, slowly, gradually, and almost without notice, I became “too busy” to hike on weekends as other responsibilities called…or were created. Backpacking would have to wait, I reasoned, until vacation or better weather, so I stored my wilderness gear promising I’d return to it sometime next weekend, next month, next season, next year. Though I did rally once, bought a new mountain-bike and rode the hills in Calaveras and Santa Cruz, that too found its way into storage. Then time sort of stretched, warped and twisted and the “next” thing I knew, I was 100 lbs heavier, years older, and staring at myself from Yosemite’s vista-point. As the fresh mountain air filled my laboring lungs and the revelation played it self out, my eyes blurred and welled. No threat to family or life, no financial hardship, no unfeeling or over-demanding employer, and ultimately no ill-fated relationship had separated me from this—I had done it. I had made the choice, and had it not been for coming to grips with this earlier, albeit in other areas, I think this blow might have been the worst due to its unanticipated nature. As it was, however, I was able to smile ruefully to myself, albeit sadly, stoically adding the responsibility to that which already existed in my heart, and rubbing more of the sleep from my eyes. The vista point was becoming crowded. I knew the Valley would be much, much worse. It was already bad 20 years earlier; I could only imagine it now. Our trail-master wandered over and observed how once upon a time the Valley had been filled with fire-cleared meadows and older trees when its ecosystem was less impacted. “No people on earth love their nature more—so much so that we love it to death,” I observed and wondered to myself if we were doing more harm and than good by adding our visit’s pressure to the Valley’s overburdened and now nearly artificial and mutated ecosystem. I was struck by the thought that few of these visitors would or could understand such a perspective. I’m sure they saw their visit as a natural expression of curiosity and admiration and if confronted by the negative nature of their innocuous visit would become indignant or ignore it all together. Ignore it—like I had ignored the abuses I’d subjected to my own personal landscape? Awareness, I thought wryly, as I re-boarded the bus that would take us into the Valley, is the first step toward change. Well, now I knew; now I was awake, and here we were about to attempt to open the eyes of a whole bus-load of teenagers who had never seen the Valley’s wonders before. Maybe too, I could finish clearing the eyes of one particular old man as well. Lately, I have had to process a personal revelation concerning a dear feature of my geek-centric life, something I had always believed was complimentary to, but which I now understand was in competition with, my creative writing. I love role-playing games (RPG). Though Dungeons & Dragons was published ’74 when I was 13, I didn’t play my first session until a couple of years later. While I have trouble remembering the exact date of that first game, I vividly remember the character I played—half-elf Torian Asgard—and the non-player characters (NPC) who were my companions—Sadar the cleric and Bluehelm the magic user—and the place we explored—the digs of Roghan the Fearless and Zelligar the Unknown: Quasqueton! These two great heroes had driven off a barbarian invasion but had disappeared during an expedition against said horde, leaving their stronghold, Quasqueton, just waiting to be explored and its treasures plundered. I do not exaggerate when I say that first gaming experience was a nothing short of revelatory (thank you, Ken!). Having read Tolkien, Malory, Lewis and Howard during my pre-teen years, I yearned to have adventures like Frodo, Arthur, Lucy and Conan and from the first roll of the dice, I knew I’d found a way to scratch that itch. It truly felt like I’d discovered buried treasure. It didn’t take too long for the storyteller in me to demand space at the game table. I quickly assumed the mantle of Game Master (GM) and began weaving my own scenarios for a group of players who would become my brothers-in-arms and life-long friends. Though I left D&D behind in favor of more intuitive game-engines, for the last 40 years I have continued to play, destroying the minions of evil and amassing a body of story, mythology and history to rival the most prolific of literary heroes. Due to circumstances, however, and though the crew still gathers to talk geek as we have for decades, we can’t seem find time to regularly game any more. I’m not going into the politics of this situation, for they are a rough emotional sea of wild cinematic waves and whirling simulationist water-spouts. Suffice to say that a “perfect storm” brewed itself made of equal parts life, age and personality. I would rather do is relate a realization and discovery made about myself and my creative writing while in the midst of this gale. Due to this gaming short-circuit, I found myself in a creative vacuum and as a result easily irritated, dissatisfied and, without overstatement, a bit bitter. Without regular gaming, I turned to my work-in-progress (WIP) to fill the void (which at present exists within the context of Holly’s HTTS class). It seemed natural. If you don’t have creamer, you reach for the milk. I mean, was I not creating imaginary worlds, cultures and religions as I develop my WIP? Did not heroes romp about discovering, fighting, loving, betraying, exploring, etc. in similar fashion to gaming? Were there not dark sorceries to overcome, conflicts to resolve, and villains to defeat? I thought to myself: a good bout of creative writing would be my surrogate game session while the ship groaned ominously and I waited for the storm to sort itself out. Good enough and off I went, bummed about the loss of regular bone-rolling but thankful I had a creative shelter in the storm. And indeed; while it wasn’t the same as gaming, it was medicine for my queasy stomach and balm to my wounded creative humor. So, for the last few months I created characters, spun dialogue, developed conflicts, wove plots, done necessary WIP world building and, all in all, had a rather productive time of it. Without a game to creatively develop and GM, I had directed more time and energy into my WIP. Without a game to regularly express myself and play, the desire to role-play had been somewhat assuaged by writing. To many this may seem a “Well, duh!” sort of moment. To me it was nearly as watershed as the advent of gaming itself. It made me lean back in my chair and blink. I had always known that prepping my game-world in anticipation of a GM session was a creative outlet, but up to this point I hadn’t fully realized how much I depended on it nor how much of my storytelling energy I devoted to it. I have long lamented that juggling the two has been difficult. I see now that far from complementing each other, they have been in competition much in the same way books and films compete for audience. Each mode of storytelling: books, film, rpgs, may have entertainment as a common goal, but they use different methods to do so and deliver different story experiences as a result. I think this is the main reason why those who read are invariably disappointed when their favorite book is adapted to film. It is also the reason that while gaming and fiction writing share some commonalities and even inform each other, they both demand time as a resource and as a result find themselves in competition. Though I would never exchange my years of gaming nor even now give it up—it is a very important social outlet and connection to my brothers, as well as, an enjoyable mode of storytelling—I now understand better the creativity-sink it can be and realize it is not a replacement for serious writing…no more than writing is a replacement for role-playing. Well, what to do? I plan to adapt to this new reality and learn to walk its rolling deck. I’ll not exacerbate gaming’s present illusiveness by wasting what time I have waiting for a second advent. I will embrace the situation as a mixed blessing and make the most of it by romping in my WIP’s land of dark sorceries and bright heroes. I have learned a valuable lesson: time and energy are finite. When the storm finally passes, and it will, I will strive to keep the weather-gage and maintain a more satisfying balance.